The Hollywood Sign is a famous landmark in the Hollywood Hills area of Mount Lee in Los Angeles, California, spelling out the name of the area in 50 feet (15 m) high white letters. It was created as an advertisement in 1923, but garnered increasing recognition after the sign was left up. The sign was a frequent target of pranks and vandalism but has since undergone restoration, including a security system to deter vandalism. The sign is protected and promoted by the Hollywood Sign Trust, a nonprofit organization whose purpose is to physically maintain, repair and secure the sign, to educate the world about its historical and cultural importance, and to raise the funds necessary to accomplish these projects. From the ground, the contours of the hills give the sign its well-known "wavy" appearance. When observed at a comparable altitude the letters appear straight-across. 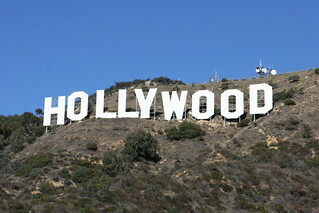 The sign makes frequent appearances in popular culture, particularly in establishing shots for films and television programs set in or around Hollywood, and appears in the background of the current CGI fanfare logo of 20th Century Fox.